Friday was “Signing Day” for nine high school seniors in Sumter School District. These soon-to-be graduates won’t be lacing up their shoes for your favorite college football or basketball team. Instead, they are signing on as apprentices with Sumter County’s largest private-sector employer, Continental Tire. The Sumter County Career and Technology Center on McCrays Mill Road played host to the signing ceremony, and two Continental representatives were on hand to extend the seniors their apprenticeship offer letters, company caps and T-shirts. The youth apprenticeship program is a partnership between the tire manufacturer, Central Carolina Technical College and the district’s career and technology center, according to Brian Rauschenbach, economic development project manager with the Sumter Development Board. The program targets high school seniors with the goal of moving them directly into employment with Continental and potentially a career with the international company, he said. In the program model, students take the center’s Introduction to Manufacturing course in the fall semester of their senior year. 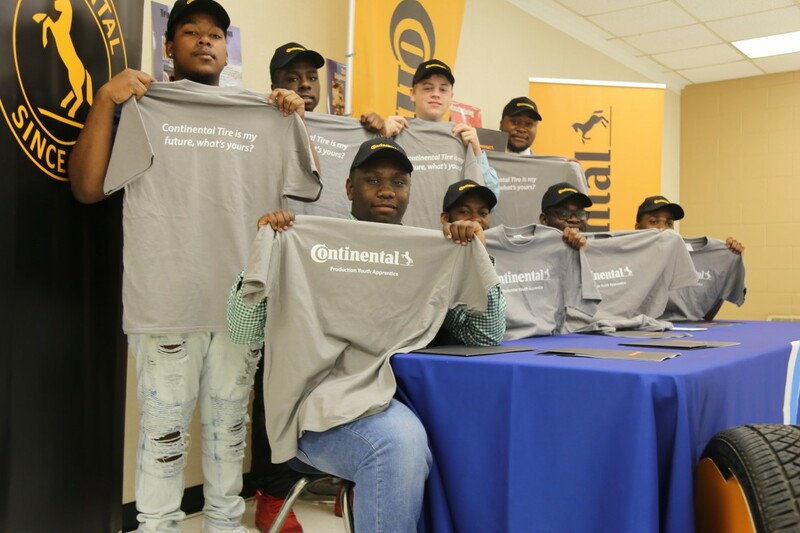 Then, based upon teacher recommendations and a face-to-face interview process with Continental, students can be selected in the spring to work part time at the tire facility after school – and be paid – while finishing their high school diploma. On the job site, each apprentice is mentored by a trainer and receives proper training in the work fundamentals. If all goes well, they can work full time during their spring break and in the summer with the potential to then move into full-time employment, said Shirrie Miller, director of the career and technology center. If the students stay on with Continental and later want to pursue higher education, there are tuition-reimbursement opportunities via Continental with two-year colleges and four-year universities. Rauschenbach said the workforce model for area high school students is one of several offered between local employers, the school district and CCTC. He added this is the third year for the youth apprenticeship program but the first time it’s had a formal signing ceremony. Sumter High School seniors Cameron Williams and Spencer Scarborough, both in their first year at the career and technology center, were all smiles after the signing ceremony and said they never thought they would have an opportunity like this. Scarborough said he wasn’t always a great student in school but that his dad motivated him in recent years to start thinking about his future – and his grades improved. He said his eyes are now set on Continental for a career. He and Crestwood High School senior Christopher McCauley also wanted to thank William Dyson, the center’s Introduction to Manufacturing teacher, for pushing them to strive for more. Miller, the career and technology center director, said the day showcased that the center offers students a “competitive advantage” because it can provide them the necessary skills to venture into the job market and find employment. She said she also wanted to thank Continental and other local businesses and industries for their support.